I wish I had thought of that phrase! It epitomises everything about my approach to Google Analytics and my books. I am a PhD scientist, though my aim is to simplify the process of gaining insights from your data. To date, I have written four books on the subject and sold over 100,000 copies worldwide and in many languages. The latest is Successful Analytics. If you have read one of my books, please spend a few seconds answering these 3 simple questions to help me understand sales. Because there’s nothing worse than a great analysis of bad data, the book has a strong focus on Data Quality, and I detail the process of how to audit your Google Analytics data without looking at code. With clean data coming in, the emphasis switches to building KPIs and dashboards, with a chapter dedicated to real-world case studies via story telling! For data managers who need to get up-to-speed on key areas, there are chapters to help you build your internal measurement process; jumpstart guides for understanding key features and tracking methodologies; help with understanding your data responsibilities for best practice and EU privacy laws; and helpful advice on building your team. Checkout unsolicited reader reviews (this site), or from Amazon purchasers. PDFs – read the Introduction or get the detailed version of the Table of Contents. If ebooks are your thing, you can purchase from the usual app stores, including Kindle. AWM was a huge success (sales greater than all other GA books combined!) and translated into 5 languages. They are technical and advanced guides aimed at deep-dive practitioners. That is, for digital marketers and analysts to understand the detail of Google Analytics. I describe the book as a hands-on manual of techniques and methodologies to solve real-world website problems using data. Please note the content is now largely out of date (covers only “classic” ga.js analytics). That is, although the principals and approach remain very relevant, specific technicalities and features of GA have moved on rapidly – including “universal analytics” and the GTM. So rapidly it has become one of Google’s most advanced products, and too rapid for such a guide/manual to be suitable for a printed book. Reviews and feedback for Advanced Web Metrics with Google Analytics are both humbling and very rewarding – its why I continue to write! So if you have read one of my books please add a review, either here or Amazon et al, and tell me what you think. Looking for the AWM book errata? i’m waiting for a new updated version of your Advanced Web Metrics with Google Analytics, also translated in italian! I can wait for him soon? @Lo – I will not be updating AWM – take a look Successful Analytics from me. I read Table 1.2 and found http://www.advanced-web-metrics.com/ is redirected to https://brianclifton.com. On the book it said,”The Excel spreadsheet of Table 1.2 is available at http://www.advanced-web-metrics.com” Where is the link? I can not found it. Please help me. Thanks. I found your AWM contains lot of information which will teach me much more than typical GA books. Am I correct? Which chapters from AWM should not be read by me? @Bhavesh – the AWM series of books were written for “classic” Google Analytics. If you are using that, the 3rd edition is good for you. However, if you are using Universal Analytics and/or the GTM, then please do not buy AWM. Published in 2012, it does not cover those subjects. Hi Brian, just been having a flick through the book (AWM3) and although the principles are still solid, it is starting to show its age a little now. When can we expect an updated AWM4 covering the likes of Universal Analytics etc.? @Jason – please see previous comment. That is, register on the Pro Lounge to be notified of the next book: http://www.advanced-web-metrics.com/blog/register/ – absolutely no spam. @Gustavo – for my next book (not AWM4, but still GA centric), I plan to sell direct form this website as well as from Amazon. E-books will be a big part of that. If you are interested in being notified when the new book is ready, please add yourself to the Pro Lounge (this site) or ping me via twitter. Hi, Brian, I write you from Argentine. I’d like to know if will be possible to buy an digital edition of your next book, because is not possible to get your books here. I bought an used edition of AWM1 from an e-commerce, but that was just good luck. Bye. I was going to buy your book and then received e-mail from Google about Universal Analytics. Do you intend to update your book to cover UA? When can we expect it? I am eager to read it and apply it, read incredible reviews about your work… thanks in advance. I have the pleasure of working with Brian as well as reading his book. I work mainly with search engine marketing and have found the book to be my Encyclopedia Analytica. The book that’s always on my desk at the office and always in my Kindle when I’m on the move. There are too many ways of tackling your problems and data to keep in mind, if you don’t work with GA on a daily basis. This book is keeping me away from misunderstanding the data in front of me and explaining how I measure success. I highly recommend the book! Do you still offer “50% off on the Google Analytics Individual Qualification test” with your book? because in the old edition i just found “Special offers from Google Inside, get a Google AdWords gift card worth $25 and find details on how you can save 50% on the Google Analytics Individual Qualification test!” but in the new one just “Google AdWords gift card worth $50!” only. I think that the book looks very interesting. However, I have a doubt. The book is publishing on March 2012, is it updated? Nowdays, google is changing so quickly and I’m wondering if I should wait to find a new edition or if I should check any tutorial to find more updated information. I would like to give Brian a great compliment on writing this book. It explains in easy words how google analytics works. Using it really good is not easy but with this book you will learn it fast! Any idea when the PDF version will be launch ? A big improvement from the 2nd edition, IMHO. A must for all the people like me that work thoroughly with Google Analytics. Thanks! and Greetings from Chile. Is this book stil up-to-date with the latest version of Google Analytics? @Joshua – the launch date of the 3rd edition was 19th March 2012, so in terms of screenshots and implementation its as up to date as then. Please bear in mind the book in not intended to be a replacement for Google’s online documentation. Rather, I go into details of building methods and techniques – explaining when and where these are applicable – in order to have the best possible data set for optimising your website. Using these techniques in then shown with real-world examples. So what I am saying is that you should not focus on the *exact* code feature set available of today. If you understand the what I do, tweaking it for any slight changes is straightforward. All code examples use the async method. Thanks for your response. I will check those chapters out in the book and respond with additional questions if I have any. Is there any case studies or examples offered in the book that specifically cover how to track, measure, and analyze the effectiveness and ROI of Facebook and twitter marketing campaigns? @James There are two key elements in tracking social media success – what happens on your site i.e. love button usage (follow me, tweet me, like me, +1 me etc)., and what happens away from your site (a campaign link initiated by you becoming viral. The first part requires the correct implementation of your love buttons. The second, requires the correct setup of your campaigns. Both of these are discussed in the book from a best practice point of view. That is, it does not matter if your focus is on social media marketing – a good implementation and usage of Google Analytics will track ALL of your visitors. Loved the 2nd edition, ordered the 3rd but it is delayed (CDON.com) any idea of when it will be shipped? Susan/ijauregui: – apologies for not replying sooner. I just noticed your feedback here! Many thanks for your praise. I hope you enjoy the 3rd edition (now out) just as much. I’ve just read your book. Thanks again for offering it to me 🙂 Your book is helping me a lot in my job (I’m web analyst in an agency). Your explanations about ROI and Real-World Task are really useful. I also like the tips you give about some KPIs and techniques. It’s very easy to understand and take in practice. Thanks for this book. I’m making my way through 2nd Edition and am picking up lots and lots. Since GA now has offered the later asynchronous code snippet and your book recommends the older snippet, is there any one-place to catch you up on things to add in all the code snippets you offer in the book — to include newer code? The older code tends to include document.write(unescape(etc)) whereas the newer code does not. Is there some kind of global comparison to use to incorporate your code snippet examples, esp the try statements in Chapter 7? When will the 3rd edition be released? 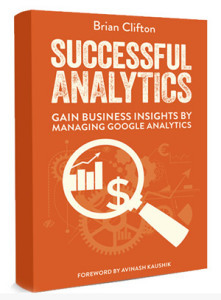 Assuming the revised edition will focus on the v.5 release of Analytics? I thought I knew alot about analytics until I was given this book as a present. Wow, it blew my mind! Great info and definitely worth adding to your collection if you are a web metrics junkie…. Does the most recent book, Successful Analytics, cover the Behavior Flow report within the Behavior Section of google analytics? I’m hoping to gain some additional insight into this report. This book is for you if you are: A digital analyst working with Google Analytics and wishing to go to the next level of your career; A manager of data who needs a solid understanding of best practice website measurement, the capabilities of Google Analytics, and how to guide your organisation’s digital strategy; A student of quantitative marketing (or economics and management) looking to gain a detailed knowledge of what it takes to be successful with Google Analytics. For all of these, your ultimate interest is in insights and knowledge, not more data! This book is about using Google Analytics in an enterprise environment – to embolden your organisation to actually use its data for important decisions – that is, not just be a hit counter. This book is about team work – providing the methods and processes to bridge the often daunting gap between practitioners and senior management. This book is about data trust – helping you ensure you have the best data quality so the rest of the organisation can trust and rely on it.